My new piece for The Nation as part of a series that I will be writing at COP21. Time for the Ents! Paris, France—It’s the first night of COP21. Free food and action planning are the irresistible combination that draw dozens of youth to an art space in late-night Paris. The passion in the room is real. So is the fear as our generation bears the burden of unprecedented global upheaval. I ask myself: Why is it that we feel this issue so deeply, but global leaders do not? For us, the climate crisis is a matter of identity. It’s personal, profound, existential. 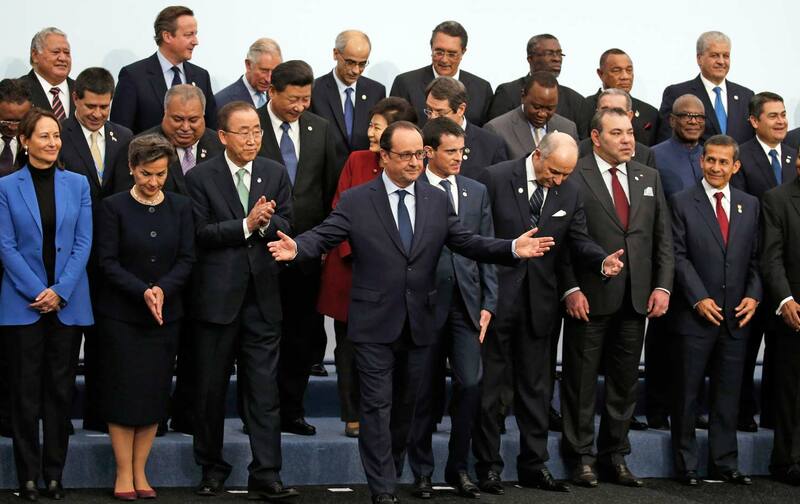 But for the heads of state who speak at COP21, climate change is politics and policies. Merry and Pippin—two Hobbits traveling with the Ents—are outraged by the slow pace of conversation. If Saruman’s forces win, their home—the Shire—and all of Middle Earth will be submerged in darkness and evil. Merry and Pippin frantically interrupt the Ents’ discussion, pleading for a sense of urgency and rapid action. “Our world teeters on the edge of doom,” they cry! “Do something!” they scream. The Ents begrudgingly make their way to the edge of the forest to better understand Saruman’s plans. The Ents emerge from the deep woods to discover that Saruman has obliterated a massive tract of Fangorn Forest. They stand stunned, staring in disbelief at a hideous graveyard. Their mothers, fathers, cousins, aunts, uncles, sisters, brothers, friends had once stood proud on that land, but they were slaughtered as fuel for Saruman’s takeover. Something shifts in the Ents’ collective soul. Reeling in pain and shock, they let out mighty bellows to summon the entire forest. The Ents storm Saruman’s castle and demolish his operations. What shifted for the Ents? At first, Sarumon was a far-off political abstraction that didn’t affect their sense of self and shared fate. But the assault on family and home turned a distant threat into an immediate challenge to their identity. In an instant of illumination and revulsion, the fight became personal. As suddenly as “the bursting of a flood that had long been held back by a dike,” it had finally become clear that “our trees and our lives are in great danger,” Tolkien wrote. Climate change, for most, is a far-off political issue. It doesn’t define who we are. This is because the climate movement is one of very few social movements that are not defined by identity. My wise friend, Kirin Gupta, rightly observed that the civil rights, LGBTQ, women’s rights, and Black Lives Matter movements are each centered on a central aspect of our beings: gender, sexual orientation, race, religion. Whereas climate change is a scientific phenomenon. How do we create common identity around climate change? How does everyone—from youth activists to world leaders—feel the crisis in their souls? We do it through love. Climate change becomes a personal issue of identity for all when we understand how it affects what we cherish. The sad reality is that the climate crisis has and will affect all of our lives. We will each experience an urgent connection with this emergency. Once something threatens who you are and what you love, you have no choice but to take action. To each politician, global leader, and decision-maker at COP21 and beyond, I ask: what do you love? What are you willing to do for all that you hold dear? Can you feel the pain, the possibility, of losing your home, your family, your community? Hold on to that feeling. Bind it to your heart. That is what I feel. That is what my generation feels. My greatest hope for COP21 is that global leaders can secretly become Ents. I hope that the endless effort of youth to convey the dire urgency of this crisis works its way into their hearts. I hope that they find a way to grasp what we feel and make it their own. If they do, it will become impossible to delay meaningful action any longer. I hope that they realize that they have the power and the ability to move beyond the slow ambiguous conversations of the status quo and lead the world out of crisis. Just like the Ents.